Spring time in Indiana is known for bringing some big rains, which can also bring some big headaches for Indiana homeowners who live above a crawl space. Waterproofing your crawl space is one of the most important things a homeowners can do. A wet crawl space can have an extreme negative effect on a home. Water in your crawl space can lead to expensive structurally wood damage, foundation failure, musty smells, and mold growth. All of which can lead to an unhealthy environment in the upstairs living area. This is because much of the air in the upstairs living area comes from the crawl space itself. This air moves up from crawl space and into the living area, carrying with it moisture, musty smells, and mold spores. A dry, waterproofed crawl space will protect your home from costly repairs and create a much healthier living area. Below are some of the more important steps to maintaining a dry, healthy crawl space. 1. Gutters - Spring time is a great time to make sure your gutters are cleaned from all debris. Clogged gutters will prevent water from your roof to flow freely through them. When gutters are clogged the water from your roof has no where to go but over the gutters and down right next to your crawl space foundation. This allows excessive amounts of water to run down next to your homes foundation increasing the chances of foundation issues and/or water in your crawl space. 2. Down Spouts - After the gutters are check and working properly, it's very important to make sure the down spouts from these gutters are installed far enough away from your homes foundation that the water from your roof is not dumping right next to your homes foundation. On a 1200 sq.ft. roof every 1" of rain will produce about 750 gallons of water. That is an extreme amount of water to just let dump right next to your homes foundation. Extending down spouts away from your home can help prevent costly foundation issues and unnecessary amounts of water in the crawl space. 3. Grading - Negative yard grading or yard grading that slopes toward your house instead of away from house can also lead to a wet crawl space. Ensure that your homes yard is graded in a way that any water runoff will run away from your homes foundation. 4. Sump Pump/Drainage - In many cases a homeowner can do all 3 steps listed above and still have a problem with standing water in the crawl space. These can be caused by a high water table and the type of soil around the house. In Indiana this is an all too common problem. To help reduce the chance for standing water in the crawl space a sump basin and sump pump may need to be installed along with proper drainage in the crawl space. If your crawl space has a sump pump, it's a good idea to check it multiply times throughout the year to ensure its working properly. If your sump pump is very old but still working, it may not be a bad idea to have it replaced anyway. 5. Vapor Barrier - A properly installed vapor barrier is also key to reducing excessive moisture in your crawl space that can lead to costly problems. 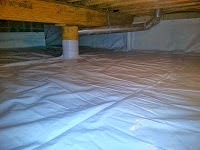 Even if the crawl space has no signs of standing water, a vapor barrier is still a must. Moisture is consistently escaping up out of the dirt floor of your crawl space. A properly installed vapor barrier on the dirt crawl space floor will greatly reduce the amount of moisture coming up out of the dirt floor and into the living area.